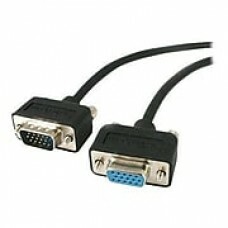 StarTech.com® 15' Black VGA Co-axial low-profile cable extends the connection of video source and high-resolution VGA monitor. Supports 1024 x 768 resolution video signal. StarTech.com® VGA Co-axial low-profile cable in black color delivers high quality video signal from a video source to VGA monitor. The 15' cable comes with ferrite core to secure data from electromagnetic and radio frequency interference. Cable eliminates picture ghosting and fuzzy images to provide precision output. Molded design of the male-to-female HD15 VGA connector prevents wear and tear during installation. Nickel-plated connectors prevent signal loss due to oxidation or corrosion. Impedance rating of 75 Ohms to deliver videos with full brightness and vibrant picture color. Low-profile cable has lightweight design for easy portability and to provide hassle-free wiring in desktop environments.